Celestial Murals Glow in the Dark! Megan McKeithan of Visionary Mural Co. now paints glow in the dark phosphorescent star murals for ceilings and walls of home theaters and rooms all around the metro Atlanta area. Megan McKeithan, of Visionary Mural Co., now paints phosphorescent glow in the dark star murals on ceilings or walls in the Atlanta area. 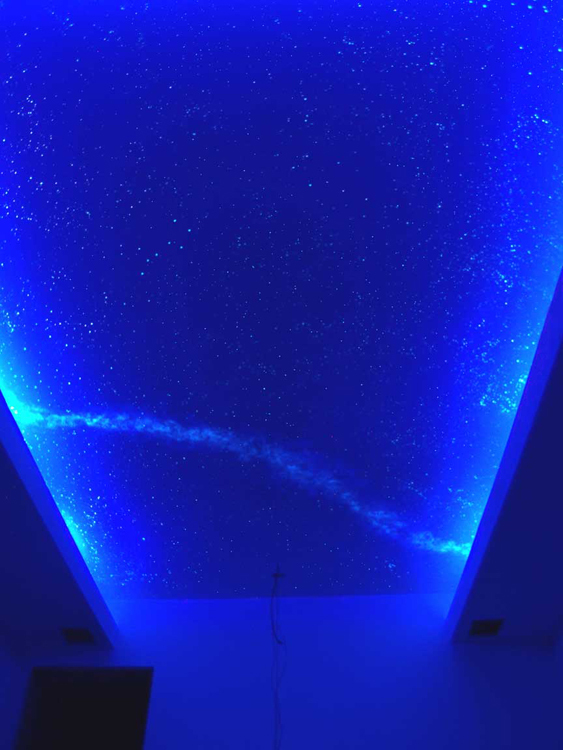 Celestial murals painted on ceilings or walls by Visionary Mural Co. appear nearly invisible in regular light but glow beautifully in black light and in the dark. 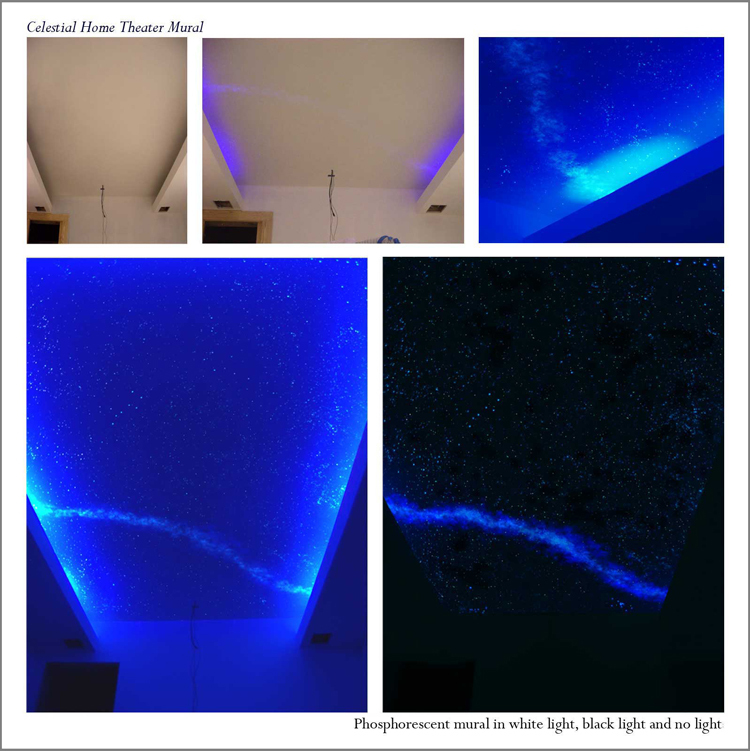 One of the most affordable ceiling treatments available for home theaters and other rooms, glowing night sky murals pack a lot of bang for your buck! Glow in the dark home theater ceiling mural by Visionary Mural Co. in Kennesaw, just outside of Atlanta, GA.
Megan McKeithan, of Visionary Mural Co. painted this glow in the dark star mural on a home theater ceiling in Kennesaw, GA, just outside of Atlanta. 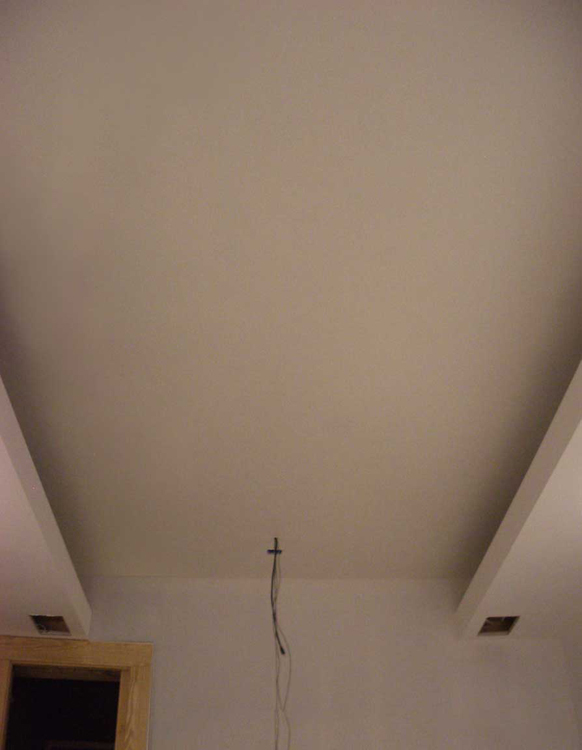 The home theater ceiling was first painted in an off white color. Even though she used four colors of phosphorescent glow in the dark paint to create the effect, the paint appears off white when it is not glowing so the mural is camouflaged in the the white light of the room. Keep in mind that the lighter the ceiling color, the more light the phosphorescent particles in the paint receive and can then reflect back to create the glowing effect. 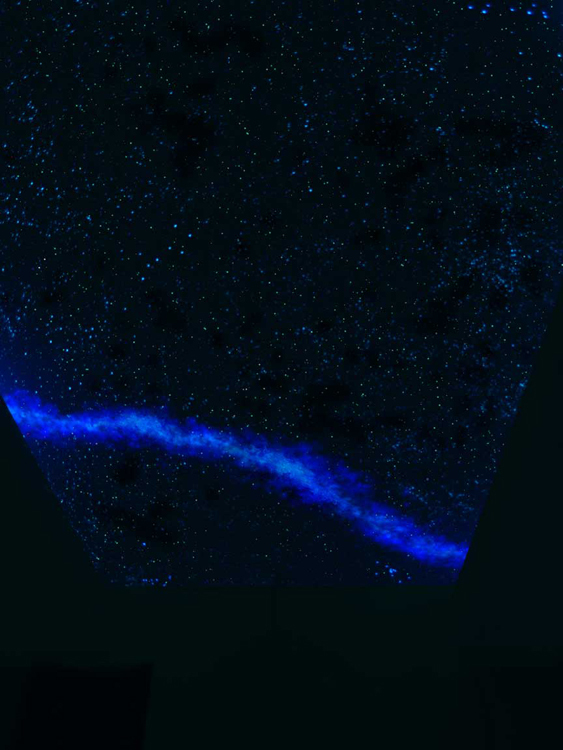 So, even though people sometimes paint star murals on dark ceilings, the lighter the ceiling color, the longer the after-glow effect will last. 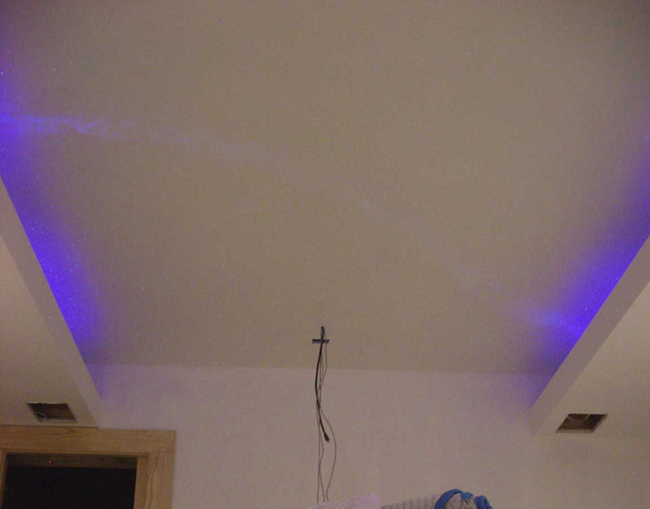 Megan’s clients installed black lights in the soffit. These lights are basic fixtures for black light, just like fluorescent tubes used in utility lighting. 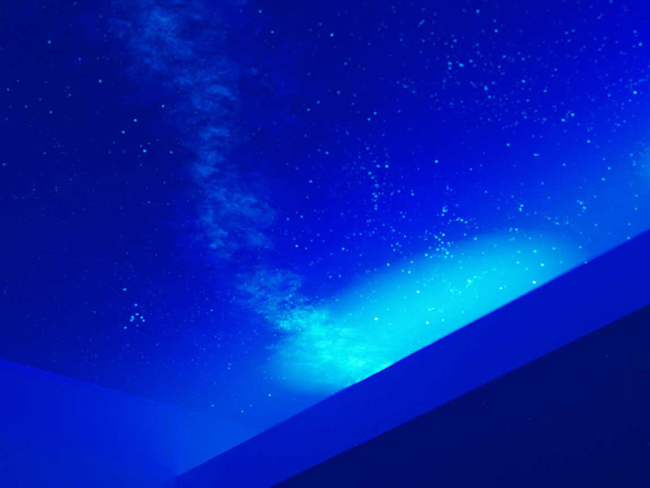 When you turn on the white lights of the room and the black lights at the same time you can see the stars mural begin to appear as if it is encased in the ceiling. It is an amazing illusion to watch it come to life! Once you turn off the white lights and keep the black lights on you can see the ceiling mural come to life. You can charge your star mural with black lights or white lights. You need to charge the paint particles in your star mural for at least thirty minutes to ensure long lasting after glow. It is best to use up-lights to charge the mural, so you can aim as much light as possible at the phosphorescent particles in the paint. These tiny particles capture the light and reflect it back to you as after-glow. The black lighting creates wonderful atmosphere in the theater while charging the mural. With the black lights on everyone can come in to the theater, get settled in their seats and enjoy the mural in the other-worldly glow before you turn off the lights. Megan’s clients chose to have have an all over star effect. Megan included the zodiac constellations of the family’s zodiac signs in the corners of the room, as well as the Big Dipper over the seating area. Some people might choose larger constellations to highlight. Megan can help you decide which constellations to place where in your room, depending upon your tastes and the scale of your ceiling or walls. Capricorn is featured in the corner of the room to the left of the Milky Way in this photo. Megan uses top quality phosphorescent paints not sold in retail stores to ensure that you get hours of after-glow time for your murals. Cheaper consumer paints will start to fade within minutes, while these paints can last many hours, depending on the color you choose. You can see there are three colors in the Milky Way, with the violet being the most subtle but creating a wonderful deep space illusion. Turn off the black lights and voila! The effect of the glow in the dark phosphorescent paint will last for hours. 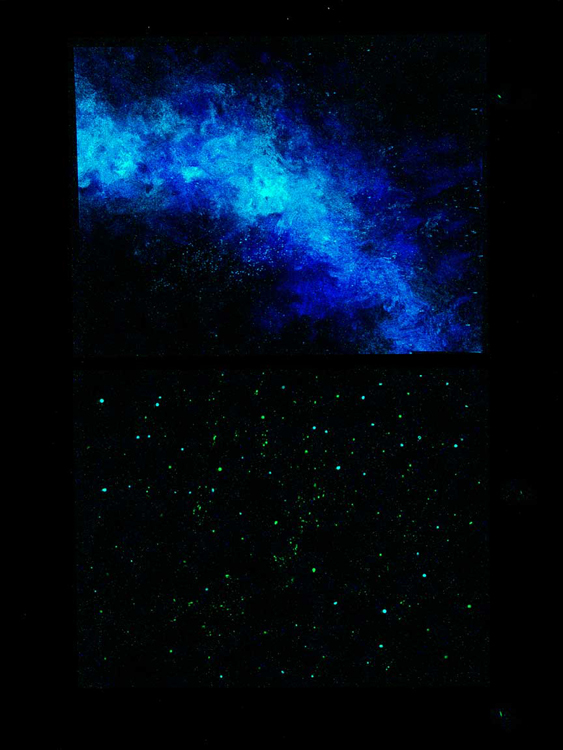 The paint particles are bright enough to light the room like the stars do outside on a clear night with no light pollution. The effect is actually quite magical, especially when you consider that it is a surprise you would never know was there with a light colored ceiling. To show her clients what the effect would look like in their home theater, Megan prepared these sample boards. Each picture is of the same two sample boards. First, in white light you can only see the base color off-white paint. You will need to paint your ceiling in an eggshell sheen paint, not flat! This will allow Megan to manipulate the paint and get the effect just right. 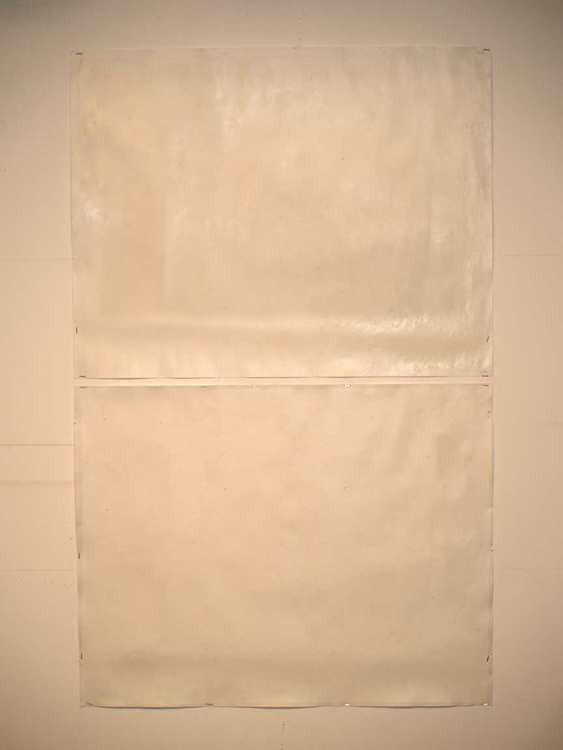 Flat paint would soak the paint right into the wall and not allow for illusions like the Milky Way. 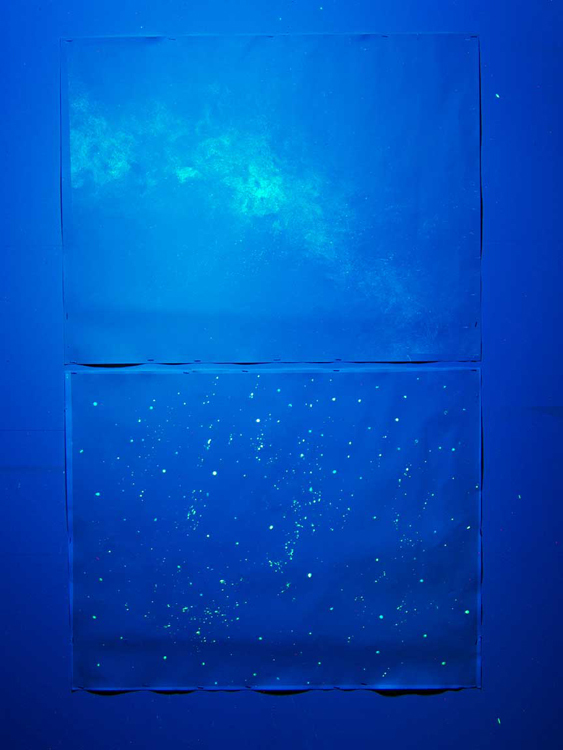 The same sample boards are shown here in black light. Keep in mind, this is shot with one black light fluorescent bulb in a clip lamp, not a long tube in a fixture you would have in a home theater. Even with only one small bulb you can see the effect of the black light, but with more light you’d be able to see even more of the Milky Way. The same sample boards are shown here in no light. You can really see the various layers of the Milky Way here, along with a variety of sizes of stars, helping to create the illusion of deep space. Megan can use up to seven colors to create stars, constellations, nebulae, or galaxies. Each color appears off-white when not charged, but glows beautifully in the dark. The colors each have different after glow times, with the warmer colors fading a little sooner than the cooler colors. Megan can work with you to achieve whatever effect you’d like to create! 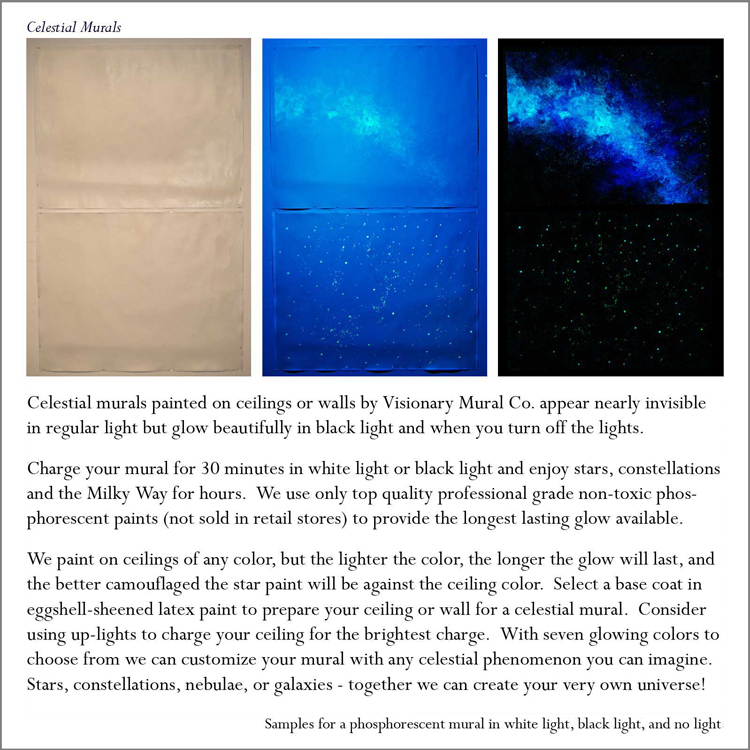 To get started on your glow in the dark star mural, first measure your room’s ceilings or walls. Then consider up-lighting, along with white lighting and black lighting options. Look at space pictures you like and determine if you want to try planets or moons, constellations or nebulae. 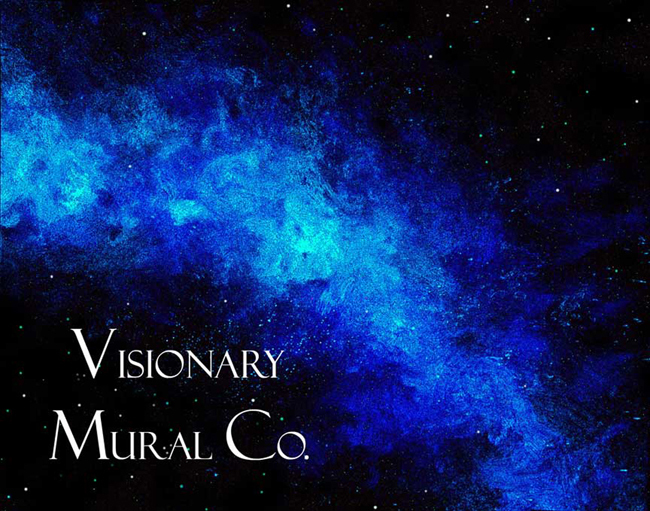 Then, contact Megan McKeithan at Megan@VisionaryMuralCo.com to get started on your star mural. She can help you make decisions about the design of the mural and style of the sky. She can also help you select the right base color for your ceiling or wall.